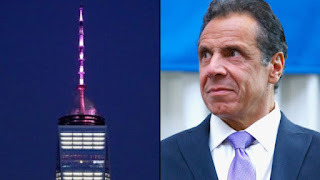 The Governor of New York Andrew Cuomo blamed budget shortfalls on the population decline in the state. This is the same governor who was cheering late term abortion last week. Hmmmm...population decline and abortion. Think there might be a connection? But let's be honest, when it comes to what they love more between aborting children and spending the next generation's money, they'll just continue to do both until they can't. Cuomo just blames Florida. He should blame Planned Parenthood but he won't. You see, Florida doesn't donate money to his coffers. Planned Parenthood does. End of story. I wonder if abortionists ever bring their children to work. Another facet of that problem is that New Yorkers are fleeing the state because they are tired of being taxed to the whazzoo. to create the problem. It is amazing. I live in Jersey and New Yorkers are moving in on a daily basis. Almost every home sale goes to a New Yorker. NOT THAT NEW JERSEY IS A UTOPIA, far from it, but things must be so bad there that they'll flock here.